What do burgers, wine, and groceries have in common? Answer: One man... Joel Gott! 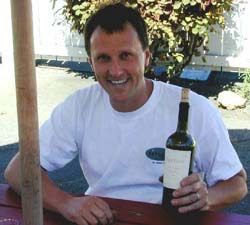 His dad co-founded Corbett Canyon, was also the first cellar employee and later went on to become the CEO of Sterling. If you ever visit Napa, you have to stop at Joel's burger stand which goes by the name Taylor's Refresher. This striped down dinning outlet is Napa Valley's hottest burger stand. It offers a fun place to stop for some munchies between tasting Napa's finest grape nectar. Famous Wine Whore, Robert Parker, declared that Taylor's double cheeseburger was his "most memorable meal of 1999" and after dinning on the benches of this casually gourmet establishment, this Wine Whore nods in agreement! It is not all burgers, fries, and wine. Joel also operates the car wash next to Taylor's and co-owns "Calistoga's coolest grocery", the Palisades Market. Check back for winery and wine reviews of these selections! Also, very special thank you to Ann and the folks from Gott Wines for their kindness, support, and willingness to share a glass of their wine for the rest of the world to enjoy. Once again, I vote only to find I'm the only vote for the Zinfandel...What's wrong with this system (or me)? Wow. Mr. Gott seems pretty busy. That's a man who has no down time. Your not the only one voting for the Puccioni Dry Creek Valley Sonoma Old Vine Zinfandel. Now there are two :) Old vine zins are a favorite for me. Wish we had seen Talyor's when were in Napa earlier this year. Will definitely check it out next visit.